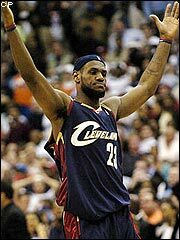 LeBron James will be staying Cleveland, finally easing the worried minds of Cleveland-ites far and wide who feared that he would bolt from the land of Drew Carey for more pristine digs. But the Cavaliers management stepped up, fitting James with a 5-year $80 million extension that will keep him locked up in burnt orange fringe until he's...26. Then, well, they'll have the second-half of his career to deal with when he's filled out with man muscles and become a savvy veteran. At that point, you can expect James will be signing a contract extension most likely in the katrillions. That's just a ballpark figure I'm throwing out there. Anyway, congratulations to Cleveland, city of inevitable champions.